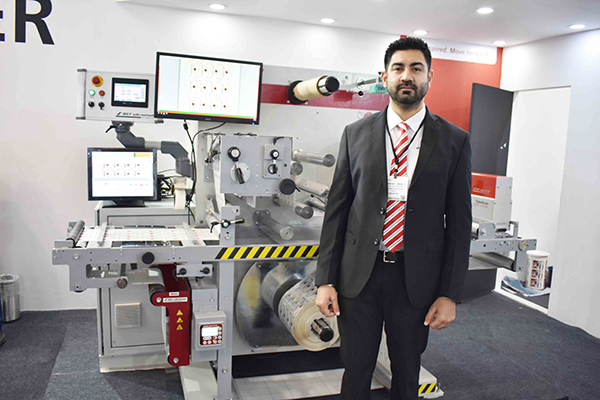 At Labelexpo India, BST eltromat India displayed its digital monitoring system, PowerScope 5000, for label printing and other narrow web applications. Although it is an entry level device from BST, a good number of flexo machines that were on display at Labelexpo India 2018 were using the PowerScope 5000 for inspection. “This is a very familiar product from BST and normally everybody associates BST with the PowerScope 5000,” said Khushal Patel of BST eltromat India. The company also displayed a slitter-rewinder system by Multigraph in which BST had provided the complete process automation. It may be recalled that BST eltromat India recently launched its new automation division for machine manufacturers and users for automating various process work-flows. In addition to technical collaboration with an Italy-based company, BST eltromat India has hired a team with experience in the automation industry to drive the new division.